A rearing method which has been illegalized in many countries is still used at more than 88% of pig farms in Japan. These are photos taken between 2015 and 2017 at Japanese hog raising farms. 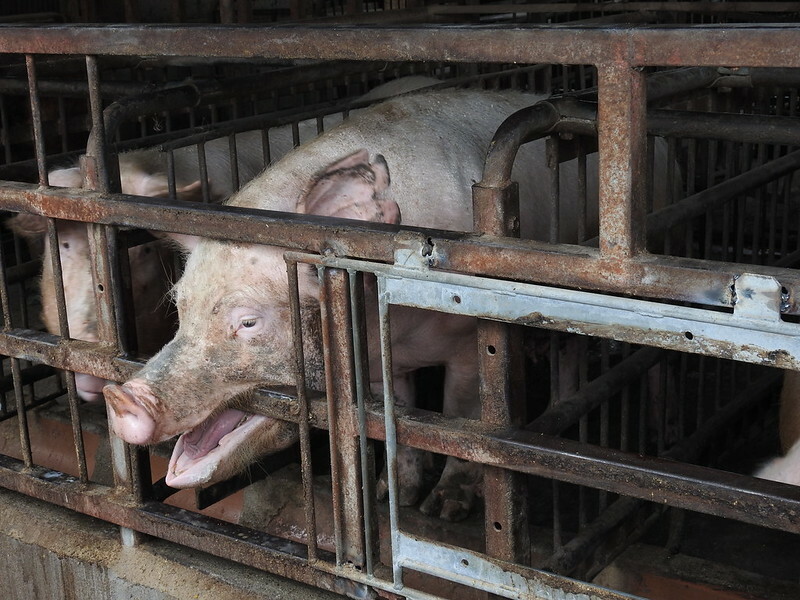 Sows are shut in a small cage called a sow stall (gestation greate). Sows spend almost all of their entire life in a cage in which they cannot walk or turn. Sows engage in abnormal behaviors such as biting their cages, continuously doing chewing motions without food in their mouths, and drinking water without stopping. 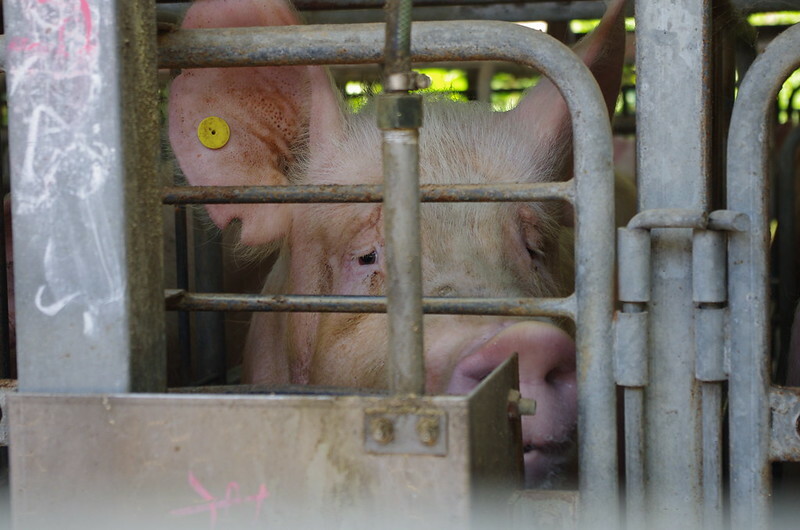 The EU banned sow stalls in 2013, and ten states in America have banned them. Using sow stalls is also strictly regulated in New Zealand, Australia and South Africa. However, it is still legal in Japan, and the stalls are made with the Japanese people’s tax money. Sow stall pig farm are still increasing in Japan. More than 60 foreign companies have stopped producing sow stalls, but no companies in Japan have made that decision. As a result, Japan is known as a country that cares little for animal welfare. More than 250 foreign companies have announced their termination of using battery cages. 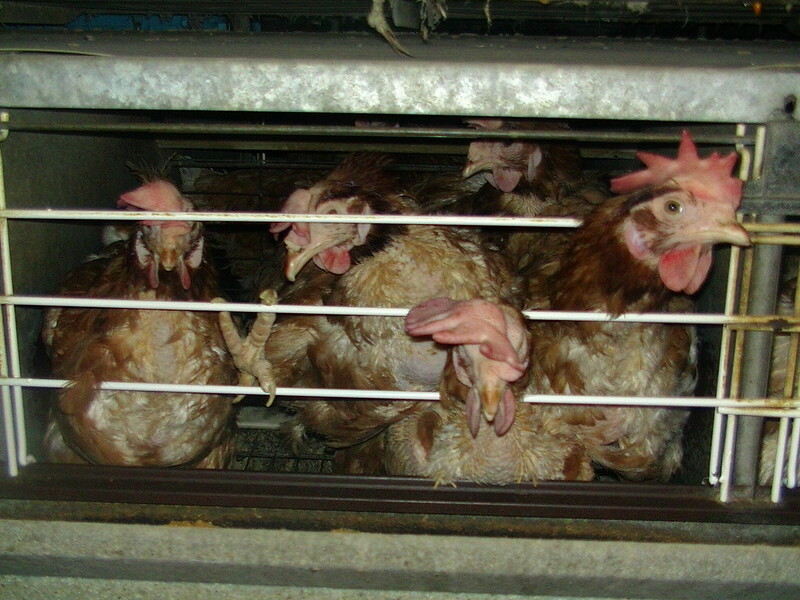 However, almost all eggs sold at stores in Japan are from chicken farms in which battery cages are used. No Japanese poultry companies have decided to stop using battery cages. These are photos taken between 2014 and 2017 at Japanese chicken farms. Chickens are packed in tiny cages without any sand boxes and perches. The size of a cage known as a battery cage is about the same as one i-pad. It is too small for chickens to flap their wings and peck the ground. 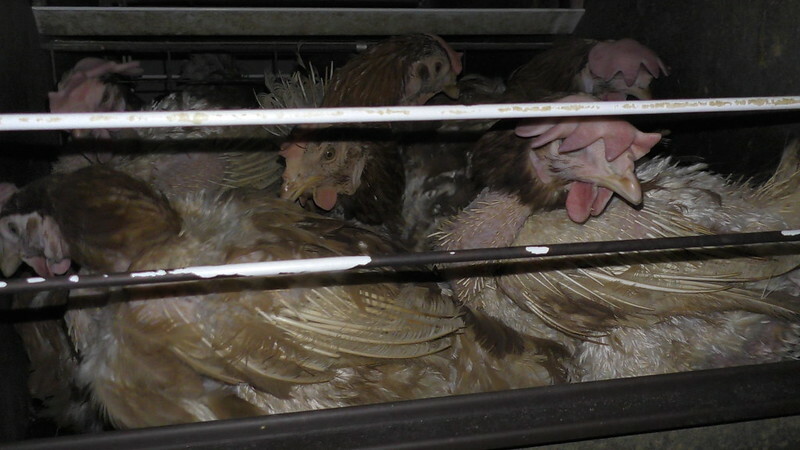 The EU banned battery cages in 2012, and six states in America has also banned them. 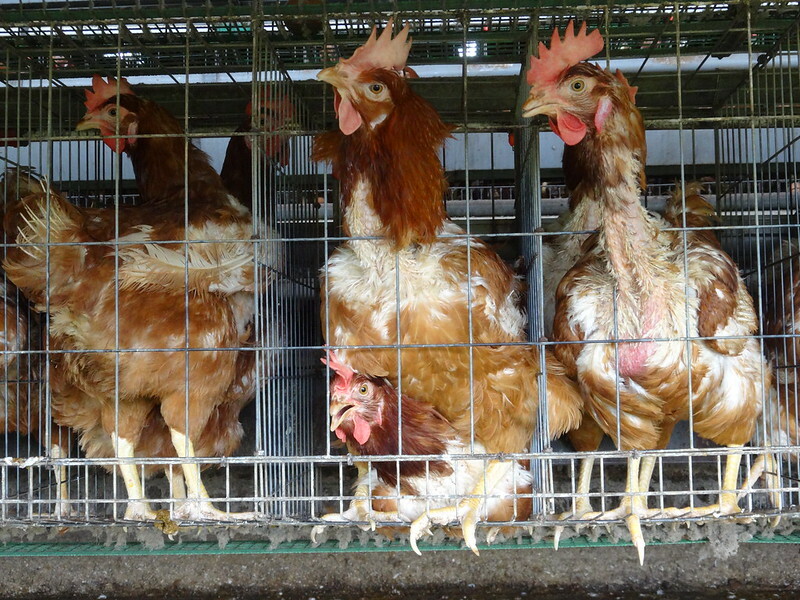 India, Canada and Bhutan strictly regulate battery cages. The Minister for Agriculture in Korea announced support for cage-free chickens. However, Japan has made no progress toward raising cage-free chicken, and new henhouses are built with the Japanese people’s tax money. This is one of many photos taken in 2016 at a Japanese broiler chicken farm. In Japan, the livestock industry is not regulated. Therefore, stocking density is not regulated in Japan. About 20 chickens may be in a small area of 1 square meter. The new way of breeding allows chickens to grow rapidly in a short period of time. However, it seriously deteriorates the welfare of chickens, which results in difficulty in walking, abdominal dropsy, and heart failure. 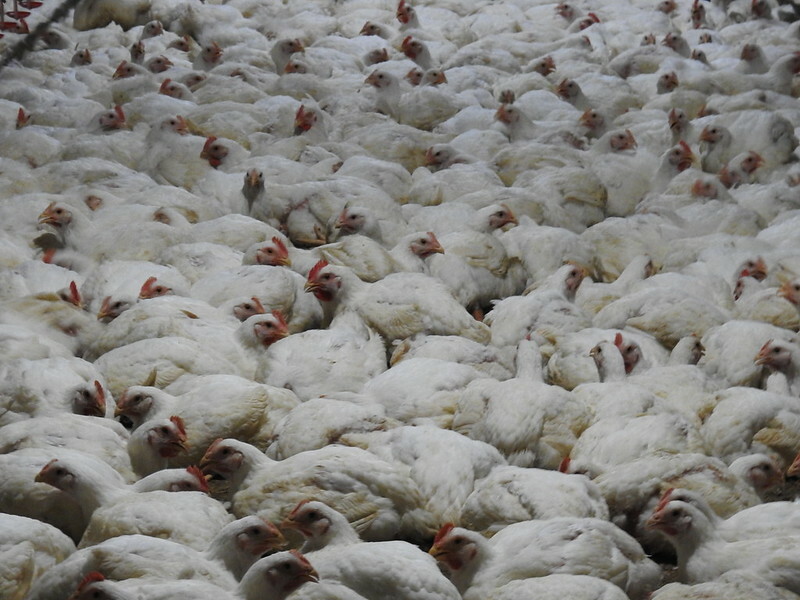 In many countries, interest in the more ethical choice, slower-growing chickens, is growing. However, many Japanese poultry farms are still trying to breed rapid-growing chickens.